Extremely popular clear acrylic / plastic box style picture frames have a hollow back and white core box. Mix and match sizes to create a unique gallery wall. Popular clear acrylic / plastic box style picture frame with a white core box for 4x6 photos or documents. Can be displayed either horizontally or vertically. Popular clear acrylic / plastic box style picture frame with a white core box for 5x7 photos or documents. Can be displayed either horizontally or vertically. Popular clear acrylic / plastic box style picture frame with a white core box for 8.5x11 photo or documents. Can be displayed horizontally or vertically. Popular clear acrylic / plastic box style picture frame with a white core box for 11x14 photos or documents. Can be displayed horizontally or vertically. Popular clear acrylic / plastic box style picture frame with a white core box for 16x20 photos, posters or documents. Can be displayed horizontal or vertical. Popular clear acrylic / plastic box style picture frame with a white core box for 18x24 prints or posters. Can be displayed either horizontally or vertically. 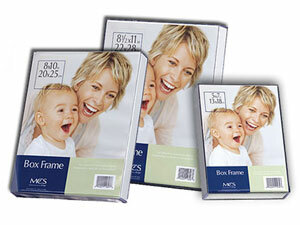 This very popular MCS Box Picture Frame is made of clear acrylic / plastic with a white cardboard box core. Photos or documents can be displayed either horizontally or vertically as a wall frame or on a tabletop*. Mix and match frame sizes and styles to create a unique gallery wall. Note: Frames over 11x14 can not be shipped outside the 48 continental US States.